T-Mobile CEO John Legere, speaking from inside the cover of a Trapper Keeper. Sprint (S) and T-Mobile (TMUS), are close to finalizing a $32 billion merger proposal, according to reports this week. If approved by regulators, the deal would unite the nation's third- and fourth-largest carriers into a combined entity with subscriber numbers comparable to industry leaders AT&T (T) and Verizon (VZ). The rumored merger has generated skepticism from some industry observers who worry about the creation of another telecom behemoth. But both Sprint and T-Mobile have been losing money consistently, and they argue that they need to combine to take on their larger competitors. 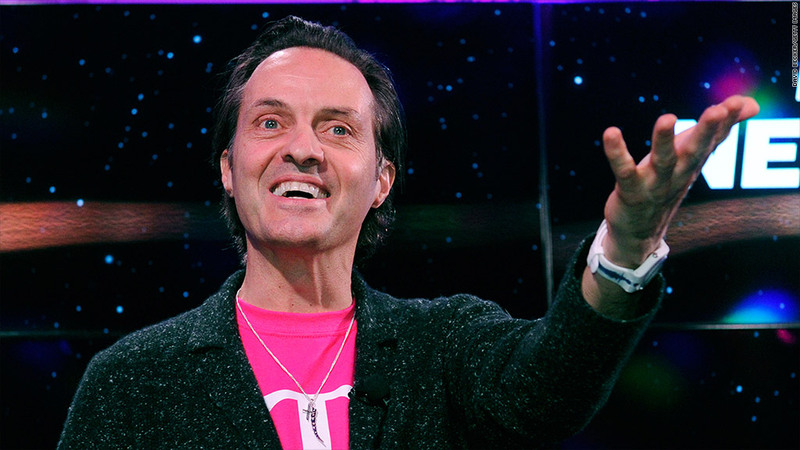 T-Mobile has provided a strong argument for the virtues of competition in recent months. Since the beginning of last year, the company has been engaged in an aggressive marketing campaign dubbed its "uncarrier" strategy. The goal is to upend the mobile industry, and it's been doing that by eliminating contracts, dropping international roaming charges and offering to pay competitors' customers $650 to switch over. The company is also investing heavily to upgrade its infrastructure and expand its high-speed 4G-LTE network. Sprint, AT&T and Verizon have all cut prices in response to T-Mobile's campaign, and they have begun moving away from two-year contracts as well. This is the scenario the Justice Department envisioned when it blocked AT&T from buying T-Mobile back in 2011, saying the deal "would eliminate the important price, quality, product variety, and innovation competition that an independent T‑Mobile brings to the marketplace." 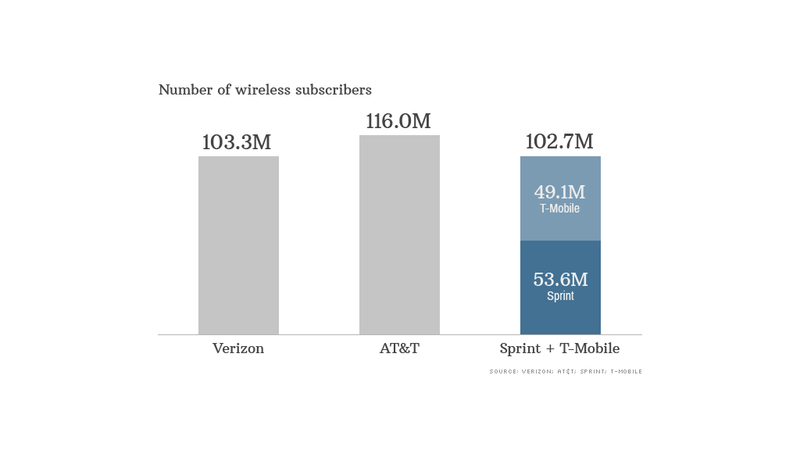 So far, T-Mobile's efforts have paid off in the form of increased market share. The company said last month that it added a record 2.4 million subscribers in the first three months of this year, its fourth consecutive quarter with over 1 million total net additions. But these efforts have come at the cost of narrowing margins and widening losses. T-Mobile finished the first quarter with a loss of $151 million, up from $20 million in the last three months of 2013. "They can't continue this forever because it will cost them too much money, so the question is what's next," said industry analyst Jeff Kagan. Some analysts see the carrier's recent moves as an effort to boost its asking price in a potential acquisition. T-Mobile CEO John Legere said last month that consolidation in the industry was "a matter of when and not if," and that his company could benefit from the additional scale and assets a merger would offer. Masayoshi Son, CEO of Sprint parent SoftBank, calls the U.S. wireless industry a duopoly, and says sustainable competition will emerge only with a third strong competitor. Sprint and T-Mobile did not respond to requests for comment. The merger proposal has yet to be officially announced, but antitrust officials already have a lot on their plates. AT&T announced last month that it hopes to buy America's biggest satellite television provider, DirecTV (DTV), in a deal worth almost $50 billion. Comcast (CMCSA), meanwhile, is trying to acquire Time Warner Cable (TWC), a $45 billion deal that would create the country's dominant provider of television channels and Internet connections. "So much is in flux," Kagan said. "The industry is changing, and regulators now have to look at it from a new perspective." Akshay Sharma, an analyst with Gartner, said the Justice Department would likely look more favorably on Sprint's bid for T-Mobile than AT&T's failed effort from a few years ago, given Sprint's smaller size. Should the deal fall through, T-Mobile could prove an attractive acquisition target for another big tech company like DISH Network (DISH) or an overseas carrier. What's clear is that neither T-Mobile nor Sprint can afford to maintain the status quo too much longer. "It's innovate or die," Sharma said. "They just can't sit idle."